MINNEAPOLIS, MN--(Marketwired - April 04, 2016) - HRIZONS® today announced that it has been awarded the Top Career Information Management Solution by Citi's Smarter Worklife Challenge (http://www.citigroup.com/citi/news/2016/160314a.htm), which includes the opportunity to explore piloting our JDMS® | Job Descriptions Made Simple solution at Citi. Citi invited leading technology companies to a crowd-sourcing initiative to identify innovative human resources technologies to improve Citi's "Employee Journey." They were presented with fresh and unique approaches that would help them enhance their employee lifestyle and enrich corporate culture at Citi while connecting individuals with productive and fulfilling work. HRIZONS joined 7 other awardees in this competition, which received 133 submissions from 21 countries from technology companies offering creative solutions to engage and empower employees, simplify the way they manage their company, and take their execution to the next level. HRIZONS presented their solution to Citi's HR leaders at a Demo Day in New York City on February 11, 2016 to introduce JDMS® | Job Descriptions Made Simple and showcase the value proposition it brings and how the software-as-a-service solution could improve job content, talent management use cases, compliance and overall governance and efficiencies organization-wide. This transformational solution focuses on bringing new life to job descriptions by making the employee's job the focus for promotions, performance management, succession, career planning, learning and development. 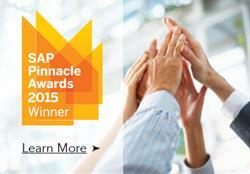 "We are very proud of this award and view it as a testament to the innovation JDMS® brings to the HCM cloud market and validation for the hard work and dedication we've put into developing this leading edge job description cloud solution. We know that companies need help to get their arms around job content and how to leverage it within their HCM technology infrastructure so they can move beyond process automation towards building truly integrated HCM technology solutions for their companies." 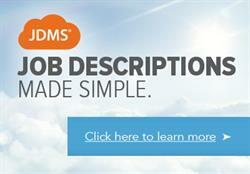 To learn more about HRIZONS' JDMS® | Job Descriptions Made Simple, click here and find out how this innovative HCM cloud solution can transform your organization. HRIZONS has been an SAP SuccessFactors partner since 2006. The company has leveraged more than 500 customer HCM cloud engagements across the globe to develop accelerate-to-value implementation methodologies, best practices, content and tools, all bringing unique value propositions to companies looking to move their HCM technology infrastructure to the cloud with SAP SuccessFactors and innovative value add solutions and services from HRIZONS. 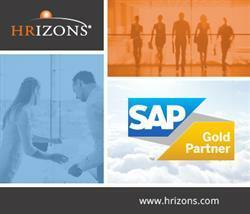 HRIZONS® is a Human Capital Management cloud-technology company that specializes in helping organizations move to the cloud leveraging SAP SuccessFactors solutions, our own JDMS® | Job Descriptions Made Simple solution, with value-add services and integration solutions. With 9+ years of HCM cloud experience, we help clients design their roadmap with HRZ®STRATEGY services, execute using our proven HRZ®EXECUTION methodology, and optimize post go-live with HRZ®EVOLUTION to help our customers achieve competitive advantage through their biggest asset: their people.